I can’t believe it was October when I posted last! Well, I kind of can believe it, since it’s been super busy here since then – but I had every intention of posting before now! 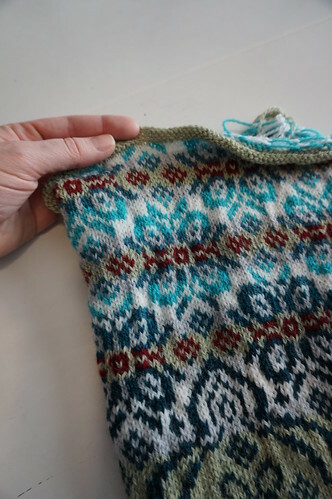 I’m still plugging along on my Master Knitter level 3 work – I’m VERY close to being finished! Just the sweater (and pattern) left to finish up. 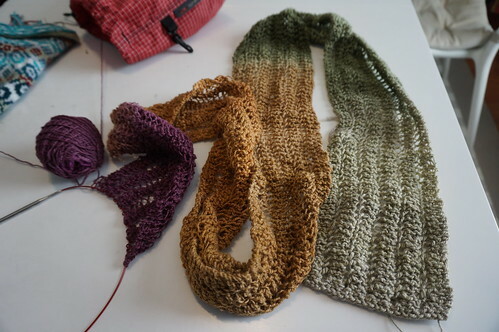 I wrote the last of all the written work (again except for the sweater pattern) over the holiday break, and all my swatches are done. 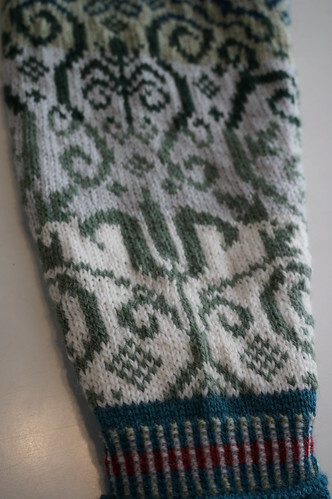 I really was hoping to get more knitting done on the sweater over the last few weeks than I did, but it’s coming along. 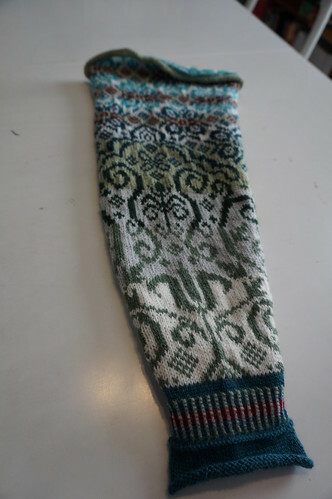 I have one sleeve done so far – the ends still need to be woven in and the cuff needs the hem sewn down. Oh, and I still need to duplicate stitch the large flower design in purple. I’m really happy with how my design is coming together! I’m really happy with the pattern and colors. The large flower will get stitched over in purple/mauve. The second sleeve is progressing, and I’m finalizing the body details as I finish this sleeve so I can start on the body right away. I still need to figure out how I’m going to do the buttonhole band, and the collar, but that can wait for a bit since those won’t be knit until the end. 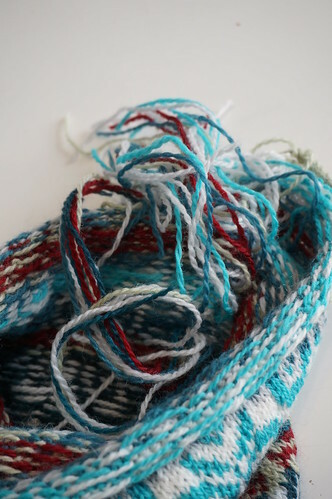 I’ll need to do some swatches to figure out the best way to get the look I want – I want to do a corrugated rib band, and I’ve not done buttonholes in corrugated rib before! 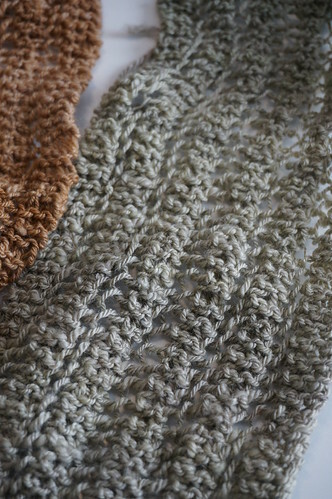 It’s a One Row scarf I’m knitting out of some of my own handspun – I think it will look really nice once it’s blocked. I love the texture in this. 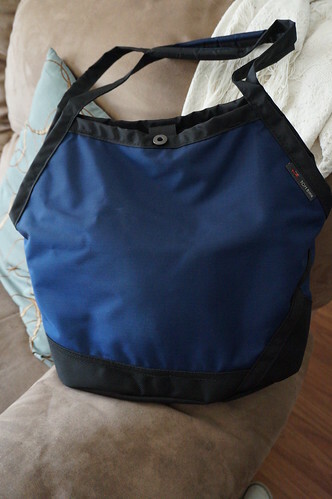 Oh, and I got an awesome knitting-related gift for Xmas – a Tom Bihn Swift knitting bag! I love it! I hope 2014 treats each and every one of you well! Happy New Year! 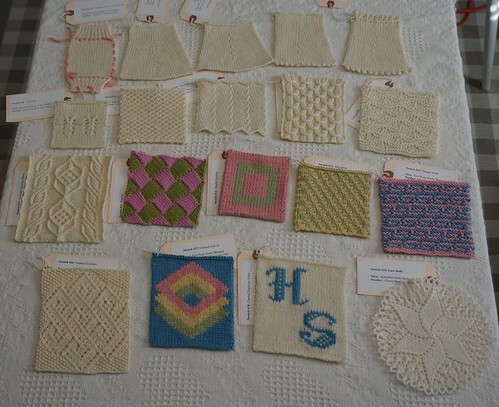 Your Level 3 swatches are beautiful, Heather!